Moving north from South Africa and Namibia Botswana and Zambia offer the next set of fascinating landscapes and thrilling adventures to enjoy. From the sheer spectacle of Victoria Falls to the peace and solitude of the Kalahari, the experiences you have while you tour around Africa will be as varied as the wildlife you see. If you’re ready for the next leg of your journey, here’s what you could see on your expedition around Botswana and Zambia. An important stretch of freshwater, these natural wetlands provide much-needed hydration for many animals in the centre of the parched Kalahari Desert. Moving away from the truck for a short time provides the opportunity to see the wildlife that visits the water from the safety of a mokoro, a type of dug-out canoe. Using a pole to propel yourself through the Delta, you will also learn how to catch fish the traditional way. Some of the animals you might see coming in for a drink includes elephant, giraffe, hippo, zebra, lion, buffalo and antelope. The Delta is a very important part of the local eco-system and during the peak flood season can swell to almost three times the original size. This source of clean fresh water draws wildlife from miles around, creating some of the greatest concentrations of animals seen in Africa. 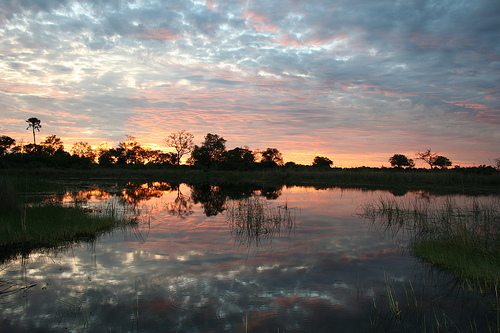 These sheer volumes of wildlife mean that the Okavango Delta area is also the perfect place to go on safari by foot. Setting out with the guides you will see many of the animals that are normally on the other side of the truck out in the open plains with just the bush between you. A truly exhilarating experience, you’ll never forget seeing the leggy beauty of giraffes gently grazing or the sound of zebra hoofs on the plains. A rather deceptive title, the Kalahari Desert is not a desert in the truest sense of the word as it receives far too much precipitation to be classed as such. The Kalahari is described as a desert because of its inability to retain water in the upper layers of its surface, so is in fact known as a ‘fossil desert’ (to be technical). Stretching over seven countries in total, the Kalahari receives a healthy level of rain which explains some of the lush vegetation you may see in certain areas. And it is this variable landscape which means that a vast array of wildlife can live amongst the sands, some of them adapting to a semi-desert lifestyle. Giraffe can live without a fresh water source for many weeks while the gemsboks don’t need water at all, getting their hydration from the leaves and vegetation. Zebra nose out roots and bark to remain well-watered and jackals are sustained by carrion. There are also honey badgers, bush babies, and porcupine, as well as the secretive leopard that enjoy the solitude of the desert environment. Birds, snakes, scorpions and frogs make up the rest of the wildlife on show, and visitors will be treated to a view of a vast array of these creatures away from any crowds. The Kalahari doesn’t have any major settlements but is home to the indigenous San Bushmen, a tribe which once covered the whole of South Africa and who language is a fascinating sequence of tongue clicks. 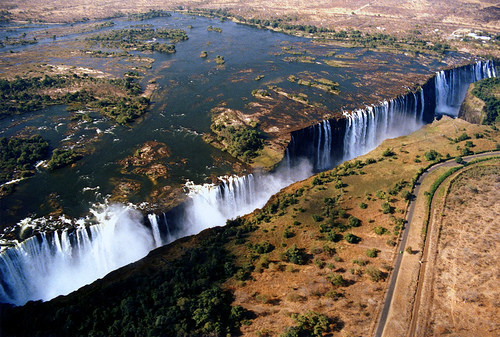 Arguably the most famous tourist attraction in the whole of sub-Saharan Africa, Victoria Falls lies on the border of Zimbabwe and Zambia. Usually better viewed from the Zambian side, in the dry season it’s necessary to cross into Zimbabwe to see the waters in full flow. A curtain of water from the Zambezi River stretching out for more than a mile wide, and plummeting more than 100 metres into the boiling pot of waters at the foot, Victoria Falls is a deafening crash of water. The sudden plunge of water is so fierce that the spray covers an area of around 500 metres; stand any closer and you will end up soaked to the skin! But as well as being an impressive display of water, visitors can carry out a range of water sports whilst at Victoria Falls. Bungee jumping, white water rafting and horse riding through the pools are just some of the adrenaline thrills on offer. Near the upper edge of the Falls there is a natural pool which extends right to the edge of the Falls. There’s no danger of being sucked over the top as there’s a stone wall which acts as a barrier and an underwater ledge which acts as a convenient seat. For visitors brave enough, guides will assist them to jump into the swirling waters and edge their way to the stone barrier, with this rocks acting as the only defence against a certain death. The most intrepid of them all take up the offer to be dangled backwards over the Falls with their legs secured by the guides against the stone wall. Most certainly a challenge not for the faint-hearted! 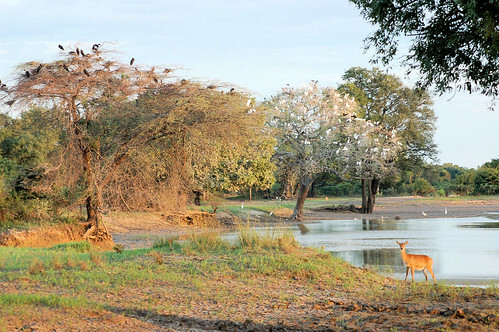 Lying in the valley of the Luangwa River, South Luangwa National Park is one of three in the area, situated in the eastern part of Zambia. Camping next to the park itself, it’s possible to do a game drive around the reserve, taking in the wildlife along the way. On and around the river itself you will see plenty of animals, including zebra and giraffe as well as crocodiles in the water or on the banks. Recent trips to the park have been successful in spotting some of the big game too such as lions, leopards and buffalo. There is a resident pack of wild dogs too which although more secretive can often be seen as well. The park remains open all year round but during the rainy season access is limited because of flooding. If the road becomes blocked there’s no way in or out of the reserve. Leaving the South Luangwa National Park behind, it’s time to move on to the next leg of the journey, travelling to Lake Malawi and onto Zanzibar, home of the spice merchants. All of the legs on these expeditions can either be enjoyed individually or as one longer trip, providing you with the flexibility to join as and when you are able to, seeing the sights which you are most interested in.